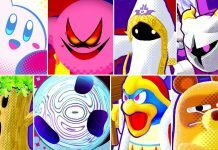 All friend abilities in Kirby Star Allies – All Combos including Rick, Coo, Kine, Gooey and the true final boss himself Marx. Previous articleWhat Happens When Mario Goes Up Against All Enemies in The Final Boss of NSMBW? Glad they added the Suplex ability back in. I wanna see Suzie here! We need her! You know how to do the movesets right? All elements on the friend star? What is the music playing through these? If Magolor comes to Kirby Star Allies, can you do a playthrough of "The Ultimate Choice" with him? U got 300 lives? Nice I got 900 lives, or more.